David Parker loved Peaks Island. He loved it so much that when he went to Korea in 1951 with the Marines, the two things he kept in his wallet were a photo of a girl named Vivian, who would later become his wife, and one Casco Bay Lines ticket for Peaks Island. We recently sat down with Vivian, and three of their children to dig deeper into the story. 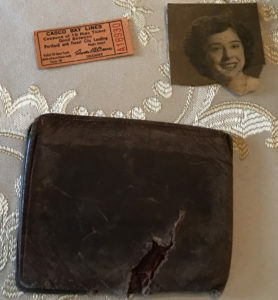 David loved Peaks Island so much that when he was sent to Korea he kept a “picnic rate” ticket for Casco Bay Lines in his wallet, alongside a picture of Vivian, as a reminder of home. David moved to Peaks Island when he was young—at first just for the summers, but then he and his family moved there full-time when he was around 16 years old. His father passed away shortly after, and David got a job working as a deck hand for Casco Bay Lines on the Sabino to help his family. Around the same time, he joined the Marine Reserves. That’s how he ended up on Hill 159 in Korea. One week before he was supposed to return home to Maine, David was moved away from the front because the military wanted to keep him safe, but when he heard his unit was pinned on Hill 159, he asked to go back up. “He never talked about what happened, but whatever it was, he won the Bronze Medal of Honor for Combat Valor, the Silver Medal of Honor [from the State of Maine], and the Purple Heart,” said David, his son. What his family does know is that he was hit from behind by mortar shrapnel. Vivian liked to joke with David that her photo in his wallet had saved his rear end. She and David knew each other before he left for Korea, but they didn’t begin dating until after he came home. When he woke up, he coughed so a soldier would notice him, and he was rushed into the MASH tent to be sewn up. 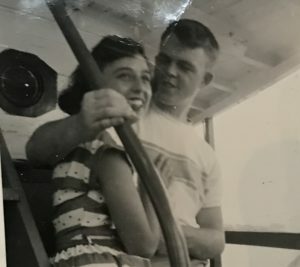 David and Vivian aboard the Sabino in the 1950s. David spent time working on board the boat during his high school years. When he returned home, Vivian picked him up because he didn’t have a license yet. She recalls driving around Portland with her brothers secretly following them, honking the horn every time David tried to kiss her. They were married on Valentine’s Day in 1953, and would have five children together—Cynthia, Mary, David, Candace, and Lori. After they were married, David and Vivian bought their first cottage on Peaks Island, for $300. From there, they moved to a house on New Island Avenue, and later onto the ocean side of the island. David became a middle school principal in Enfield, Connecticut. He and his family would spend the school year in Connecticut, but as soon as the bell rang on the last day of school, they headed for Peaks Island. “He wouldn’t ever stop to let us pee,” said David. His daughter Mary recalls that spending summers on Peaks Island recharged her father’s batteries after spending all year working a stressful job. David passed away this year after a battle with Alzheimer’s disease, but even while he was struggling with the disease, he remembered his connection to Peaks Island. 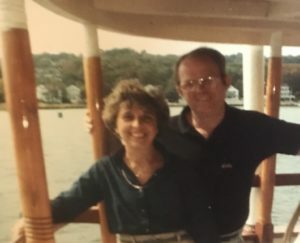 When the Sabino was moved to Mystic, Connecticut in the 1970s, David and Vivian took a ride for old times’ sake. “Two months before he went to the nursing home, he forgot he lived [in Portland], I had him out running errands, and he said, ‘well I’m ready to go home now, just drop me at the boat,’” his daughter Candace said. His family said that he loved everything about Peaks Island, but his favorite part was the relationships and connections he formed there over the years. From acting in plays at the theater to chatting up people he knew on the street, David was a huge part of the Peaks Island community throughout his life. “Even yesterday I got comments that were like, ‘I just want you to know that your dad was a really big piece of Peaks Island,’ that kind of stuff all the time,” said Candace. Over the years, David’s ties to Peaks Island and Casco Bay Lines have remained strong. Two of David’s daughters, Candace and Mary, both live on the island full time, and two of his grandchildren have worked for Casco Bay Lines on different boats. From time to time on our blog we’ll be featuring stories from island residents. Casco Bay Lines remains committed to fostering strong relationships with our island communities. If you have an interesting story, feel free to reach out to us.